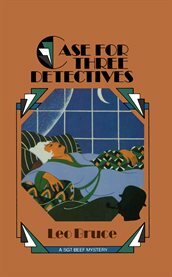 The item Case for Three Detectives : A Sergeant Beef Mystery, (electronic resource) represents a specific, individual, material embodiment of a distinct intellectual or artistic creation found in Austin Public Library. This story is possibly the most unusual mystery ever written. A murder is committed, behind closed doors, in bizarre circumstances. Three amateur detectives take the case: Lord Simon Plimsoll, Monsieur Amer Picon, and Monsignor Smith (in whom discerning readers will note likeness to some familiar literary figures). Each arrives at his own brilliant solution, startling in its originality, ironclad in its logic. Meanwhile Sergean Beef sits contemptuously in the background. "But, "says Sergean Beef, "I know who done it!"